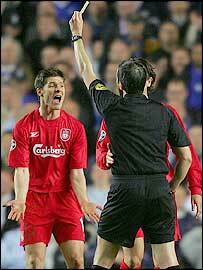 Liverpool's Xabi Alonso insists he did not deserve the booking which has put him out of the Champions League semi-final second leg against Chelsea. Midfielder Alonso is banned for one match after his third yellow card of the tournament for a foul on Eidur Gudjohnsen in the goalless first leg. "You can see on the replay I didn't touch him," he told the Reds website. "When I saw the yellow card I couldn't believe it as I knew what it meant. I feel so sad to miss the second leg." He added: "I hoped after seeing the tackle again, maybe the referee could change his mind, but we've been told it's not possible to appeal. "It's a big disappointment for me to miss the game at Anfield, because it will be a special night. "Now I just hope we can get through to the final so I have another chance to play in the competition." Alonso's midfield team-mate John Arne Riise admits it will be a blow to be without the influential Spaniard who has only recently returned from a long absence with an ankle injury. "We're going to miss Xabi as he's just come back into the team," said Riise. "He's absolutely distraught and anyone would be disappointed. We're going to play the game for him. "He says it wasn't a yellow card so it's a massive blow for him personally and also for the team because he has done very well since he came back. "We've got to cope without him. Didi Hamann is coming back from injury so perhaps he can slot in." Hamann has been out with a knee injury since 20 March - when Liverpool beat Everton. And Reds boss Rafael Benitez is hopeful that the German will play on Tuesday. He said: "Didi is training normally and I think he will be fit for the second leg. It is good news."